Geared towards off-road fans throughout the region, Oman Off-Road Guide is a must-have for anyone with a taste for 4WD fun, a love of the great outdoors and a craving for Arabian nights under the stars. Oman Off-Road has been fully revised to offer 38 up-to-date off-road driving adventures and hikes, including 17 new routes. 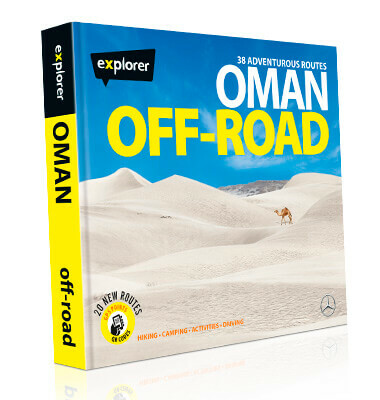 Illustrated with inspiring images of the Sultanate's beautiful landscape captured by our award-winning photography team, the Oman Off-Road guide has a new look and feel and features simple route directions and detailed off-road maps superimposed over satellite imagery. Combined with local tourism, cultural, geological and environmental highlights, the Oman Off-Road Guide helps you explore the very best of Oman's landscape in the most adventurous way possible. You'll find desert dunes, mountain and wadi drives, camping spots, equipment and driving tips and much more. This is the essential guide for ultimate adventurers, weekend warriors and happy campers alike.